There are lots of gamers reported that they are not able to play the game properly on their Windows PC, it gives the “Error during initialization-Unhandled exception caught” error message. It appears on every version of Windows system reported this error message. There are several working methods so make sure you follow the instructions. The main causes for this error are improperly installed the important libraries such as Visual C and Direct X. Many users skips these installations during the initial install process. The game works best when its own libraries are installed. Possible that running the game in compatibility mode for older versions of Windows might fix the problem. Solution 1: Install the Visual C libraries and Direct X versions. Many users skip the installation of libraries during the installations as other games install them as well. This is a reason why the game ships with that version of tools such as Visual C++ and DirectX installations. You can reinstall them from the games root folder. Start the Steam by double-clicking the icon on the desktop or by searching for it in the start menu. Switch to the library sub-section and locate the black ops 2 in the game list on your own library. Open the properties by right-clicking on its entry. Click the Browse Local Files button on the Local files tab. In the standalone version of the game, you can locate the game installation folder manually, by opening the file location from the menu. Open the ‘redist’ folder simply by double-clicking on it inside the root folder. You can see a file named “vcredist_x86.exe”. Follow the instruction in order to install Visual C.
Inside the “redist” folder you can see “dxsetup.exe” make sure it runs well and install the Direct X by the following instruction. Solution 2: Run the game in Compatibility mode. Click on the t6mp.exe file located at (C:\Steam\steamapps\common\Call of Duty Black Ops II\t6mp.exe) and select the compatibility tab. Try to play the programs in compatibility mode for windows 7 or 8. After deleting the iw6mp64_ship.exe , try to run the program. Open the Steam library and find out the Call of Duty Black Ops 2. Remove the application name iw6mp64_ship.exe from the local files tab. You can verify the cache as just described in Solution 4. Go to the properties on Call of duty black ops 2, by running it on steam. This process takes a few seconds to get completely let the process finish, it takes more times as some missing files might get downloaded. Navigate to C:\Program Files\Steam\steamapps\common\Call of Duty Black Ops II\playersfolder. The above three files are related to three game modes. you can delete the file related to the game mode that is giving you problem. Reboot the game and the game will revert to the default settings. If you are getting the error messages in Windows 10 after every update then you need to apply these fixes after every Windows 10 updates in order to make black ops 2 work again. 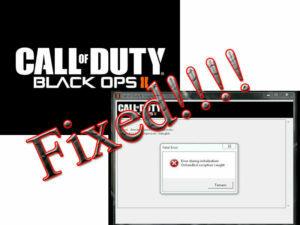 We hope that you are enjoying Black ops 2 after solving these errors. The described solutions are very effective and helpful to you and you can easily fix it.